Orlando City Soccer Club are an American professional soccer club based in Florida. They play in the Eastern Conference in Major League Soccer (MLS). Orlando City began playing in 2015 as an expansion team of the league. They are the first MLS franchise based in Florida since the Miami Fusion and Tampa Bay Mutiny. Both of these clubs folded after the 2001 season. Before Orlando City’s soccer-specific stadium was completed, the Lions had occupied the then named Citrus Bowl for their first two seasons in MLS. Orlando now play at the Orlando City Stadium – this has a capacity of 25,500! Orlando have never finished higher than 7th in their Conference, meaning you’ll need to shake up the squad and improve quickly to beat their previous best. At 35 years of age and having earnt 92 caps for the Brazilian national side, Kaka is 100% the best player in this Orlando City side. The attacking-midfielder is on £105k a week and is one of your 3 designated players permitted in the squad. Kaka will play an important part in your season with Orlando and could help you push for the title, so in my opinion play him in every game unless he is injured or suspended. Will Johnson is my other pick for a top player at the club. The defensive midfielder is one of the better players in this squad and is versatile enough to play both as a central midfielder or on either wing. Johnson also has 43 caps for Canada which shows that he can perform at the highest level and also he is an amazing penalty taker with an attribute of 18. I’d be looking to improve our squad out wide and so a search for a winger would be my position to improve in this side. Obviously someone like Christian Pulisic would be an ideal option but he’s just a distant dream! Our first hot prospect in the Orlando City ranks is Cyle Larin. He could, and perhaps should, be used as one of if not your first choice striker. The Canadian already has 22 caps for his country at just 22 years of age and he scored 14 goals in 32 games in the 2016 edition of MLS which proves that he is a great prospect. Our second hot prospect is a right-back who goes by the name of Rafael Ramos. To me, he looks like he has the potential to become an integral part of your squad. The 21 year-old Portuguese would be my first choice right-back in the squad. He has also been at Orlando City for a while now and so he’ll fit in with the others and shouldn’t need any time to bed into the squad. 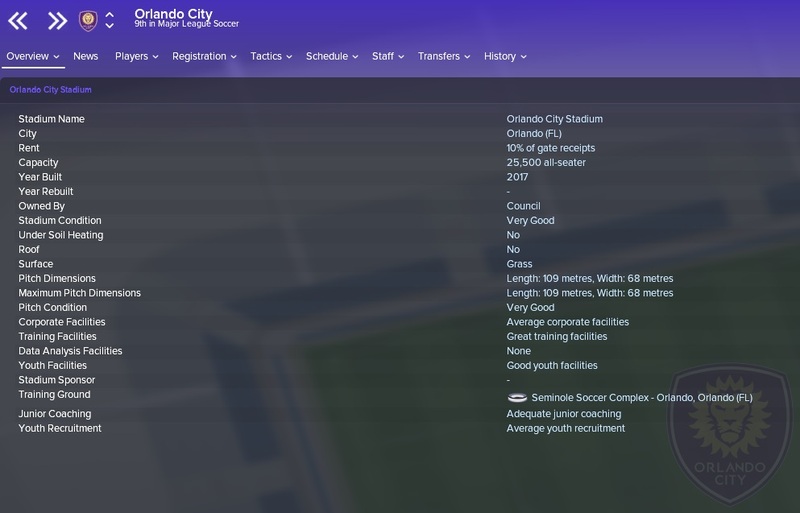 Orlando City have good finances with around £325k on the wage budget and also around £2 million in the transfer budget. With the different transfer rulings in MLS you’ll need to brush up on them and make sure that you spend within your budget. 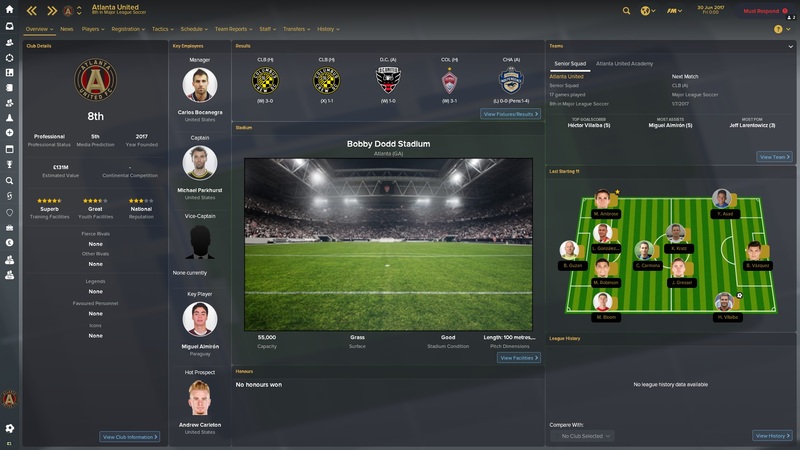 Choose your designated players wisely and make sure you don’t end up bankrupting the club! 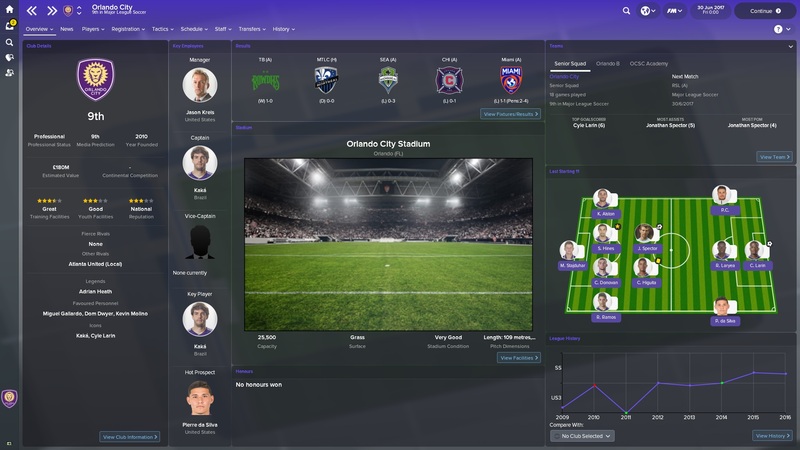 So good luck to everyone who manages Orlando City and I hope you have a fun time over in the USA, please let me know how you get on in your saves either in the comments by heading over to my Twitter @Casual_FM_. Thank you for taking the time to read this club guide! 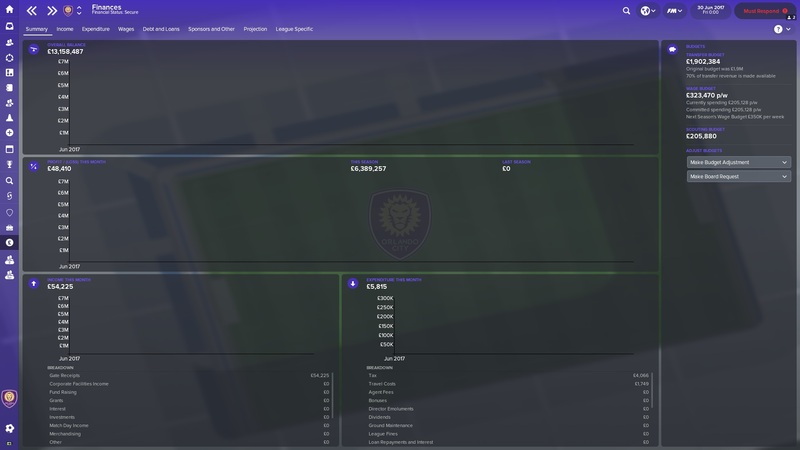 This entry was posted in FM Guides | Club Guides, FM18 Guides, Experiments & Wonderkids, Football Manager 2018 and tagged club guide, FM Guides, fm18, football manager, mls, orlando city, usa. Bookmark the permalink.